1. Child is happily painting. On paper. With brush. 3. Mom walks into kitchen. 4. Mom pours hot water into teacup. Oh my!! Yes, I have had this phenomenon happen a great many times to me! Magic I guess! The look on her face–like, what did I do?? lol- just when you think they’re of an age where you don’t have to watch them every second. 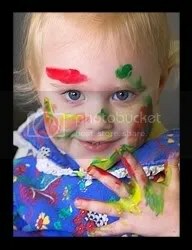 She sure looks cute with all that paint on her face! This hysterical!! It’s wonderful that you have a photo to document and have it forever!!! Way too cute! I haven’t ventured into the painting yet. Tori loves drawing with pens on herself way too much…paint is a little scary right now. I love your blog…I read all the recent posts. 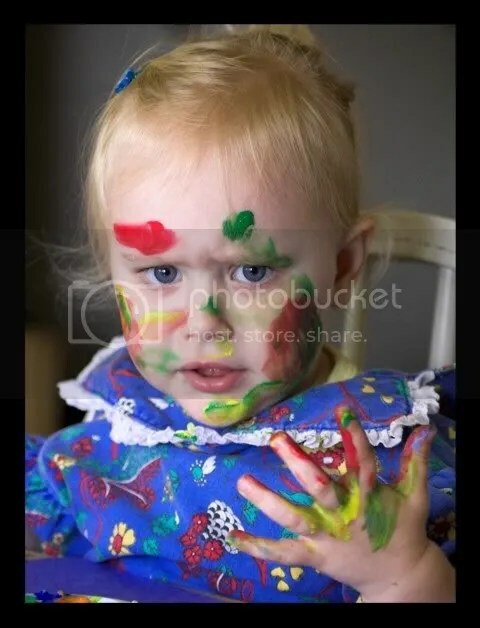 Love this one with the paint all over her face. You did what I would have done…got out the camera! If you want some ideas for alphabet lessons, let me know. I have made several ABC Scrapbooks that have been fun for the kids to do. Happy Saturday! Speaking th truth, you are.